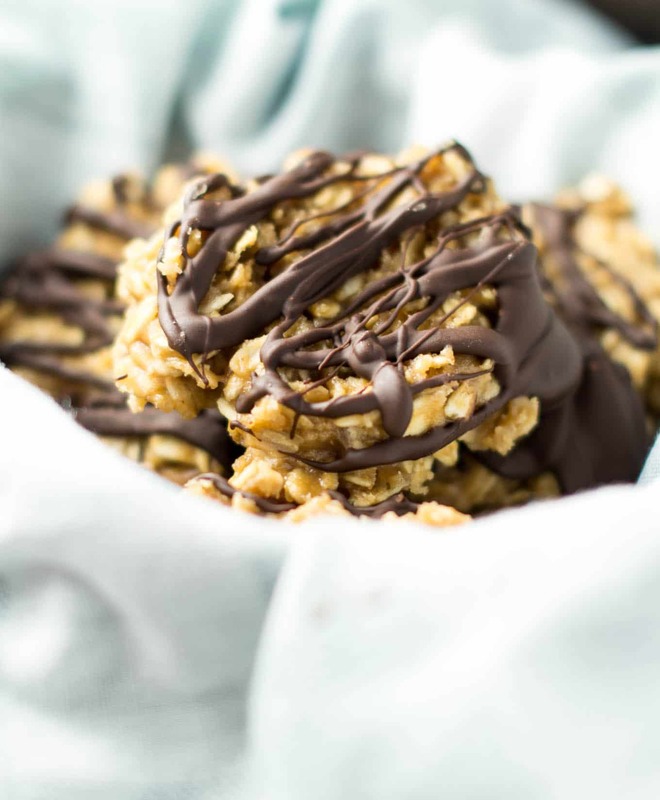 No bake cookies have long been one of my favorite healthy desserts. While I will always love my classic chocolate peanut butter no bake cookies, I decided that I wanted to switch up the recipe and try something new! 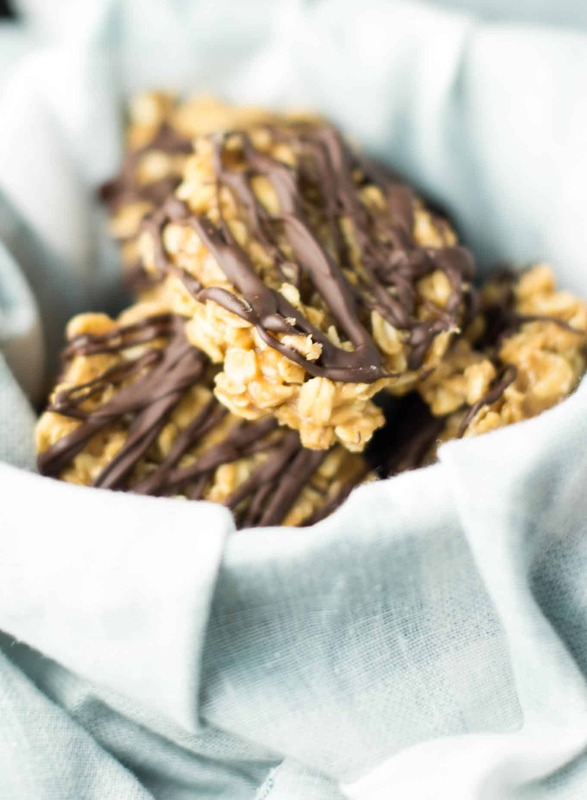 These healthy peanut butter no bake cookies are a great easy dessert packed full of protein. If you’re looking for even more gluten free dairy free desserts, click here for a roundup of 25 of my favorite recipes! 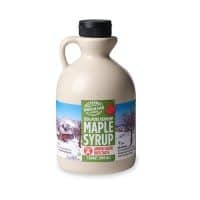 In a sauce pan, whisk together protein powder and maple syrup over medium low heat until combined. 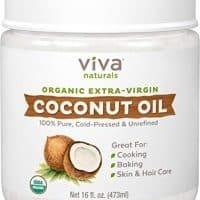 Add coconut oil and almond milk, whisking until fully combined. Add peanut butter, salt, and vanilla extract, stirring until peanut butter melts and is combined. Add oats, stir, and remove from heat. Drop batter by spoonfuls onto the sheets. Press tops lightly with a fork to flatten. Place baking sheets in fridge until cookies are set (30 minutes to 1 hour). Once cookies have hardened, make the chocolate drizzle. Melt coconut oil over low heat, stirring in the chocolate chips and salt until the mixture is melted and drippy. Drizzle chocolate over tops of cookies using a spoon. Return to fridge until chocolate hardens (10 minutes or less). 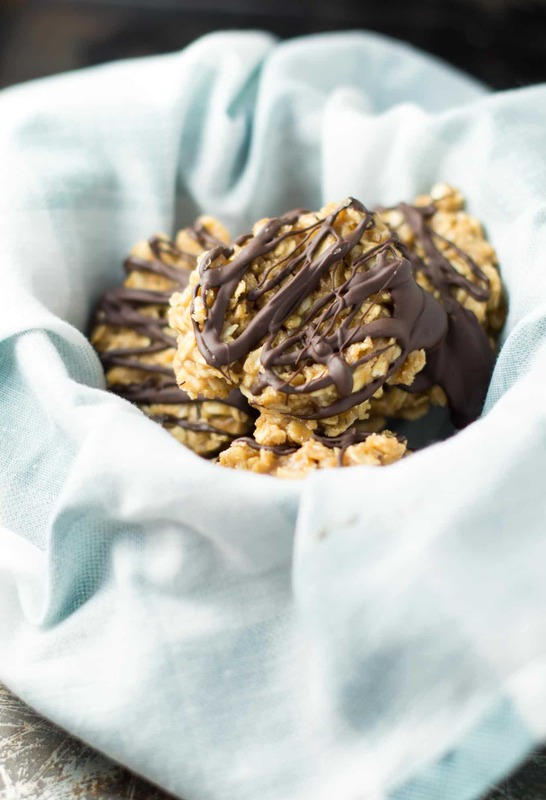 These healthy peanut butter no bake cookies are all things delicious. 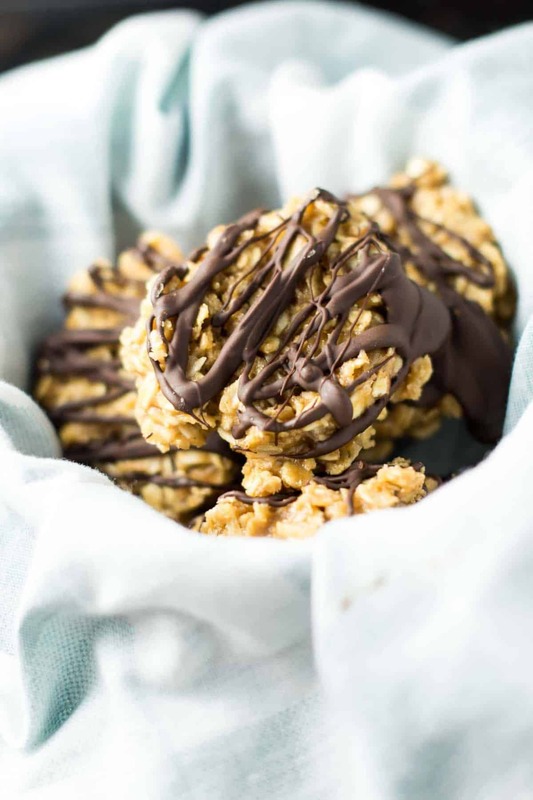 Packed full of protein, natural sweetener, and drizzled with a touch of chocolate, they are the perfect lightened up healthy dessert recipe! As a nursing mama, it’s important that my body gets lots of oats to help with milk supply. 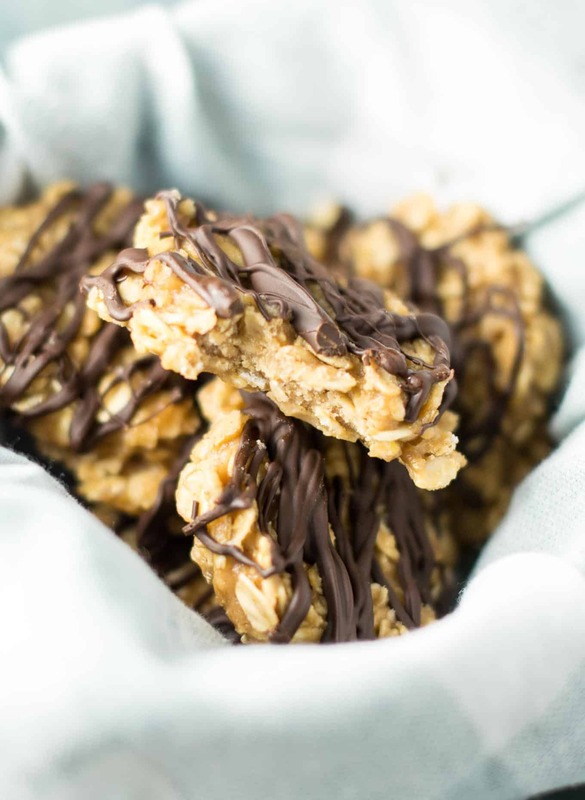 This recipe is one that I’m adding to my arsenal of easy and delicious snacks/desserts that are breastfeeding friendly! These cookies make a great healthy dessert or snack for when you are craving something sweet. So many no bake cookie recipes call for tons of butter and white sugar. You won’t find any of that in this recipe. 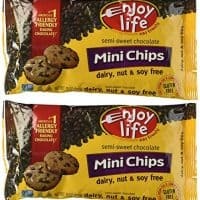 I have tried these cookies before and found them to be so excessively sweet that I didn’t even enjoy the taste. 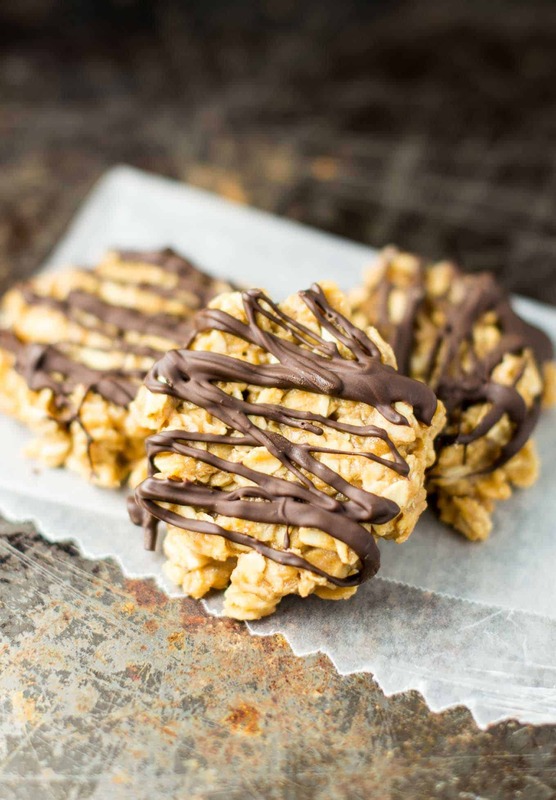 These cookies couldn’t be further away nutritionally than a classic no bake, but you would never know it by the flavor! They are so decadent and delicious. You don’t have to compromise on flavor when you eat healthy! They taste like super rich and fudgy peanut butter cups. The chocolate shell on top is the perfect complement! The chocolate drizzle is totally optional, but highly recommended. Chocolate + peanut butter = a match made in heaven. Who else agrees with me?! 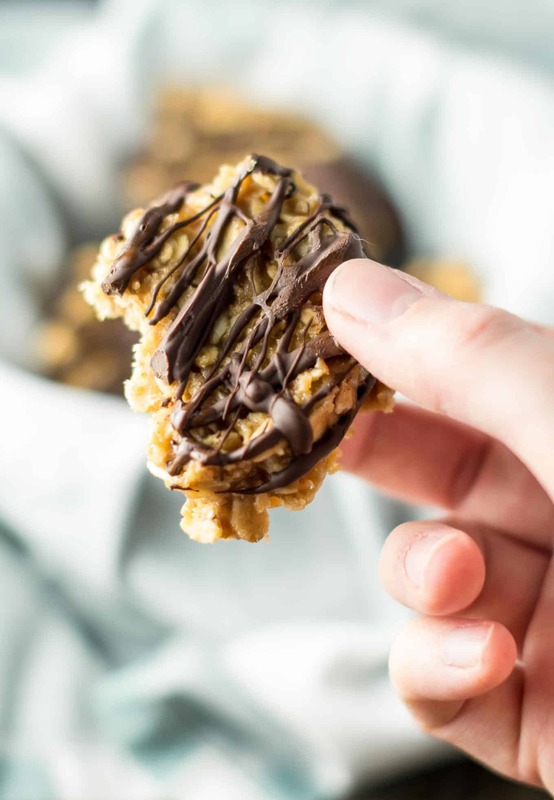 Some more of my favorite ways to enjoy peanut butter + chocolate: healthy no bake peanut butter truffles, vegan peanut butter cups, gluten free peanut butter oatmeal chocolate chip cookie bars. These cookies are easy to make, no bake, and look like a fancy dessert. If you are looking for healthy dessert ideas you will love these cookies! Once you form the cookies, let them cool in the fridge until set. This makes sure that the chocolate won’t just fall off of the cookies when you top them. Once they are set, it’s time to break out the chocolate drizzle! I prefer to store these in the freezer as they get a great fudgy texture to them. I loveee freezer desserts! Some other great treats for your freezer would be chocolate sea salt pretzel bark or ultimate healthy peanut butter fudge. You can store them in the fridge also, just be sure to keep them cool as they will melt easily. 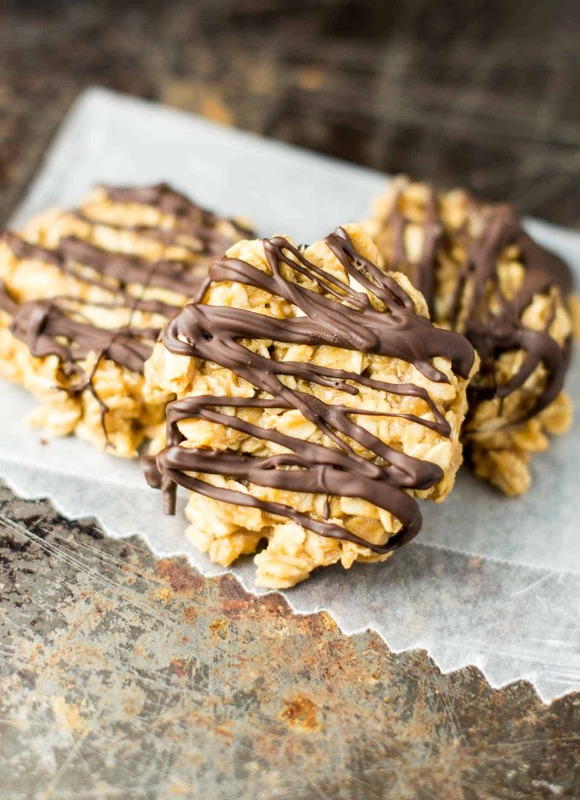 These are so rich, chewy, and decadent all while being a better for you dessert! Are you making this recipe? I want to see! Don’t forget to tag me on instagram @buildyourbite and #buildyourbite! Did you make this recipe? I would love for you to leave a star rating below! I tried this made by my friend and I’m obsessed! Delicious! So glad you enjoyed the recipe Olivia! Me and my girlfriend just made these and my gosh! These are delicious! You don’t feel guilty for eating them packed of proteins. We are already brainstorming other recipes we can make along these same lines! Great recipe will be making them again! Trying to boost protein and cut desserts. These are perfect! I made these and we absolutely love them. They are a great healthy indulgence. Any one know the nutritional information? Do you use the liquid coconut oil, or the white, pasty kind?